News & Events Heathcote House is awarded Membership of the CODE Quality Practice Scheme! 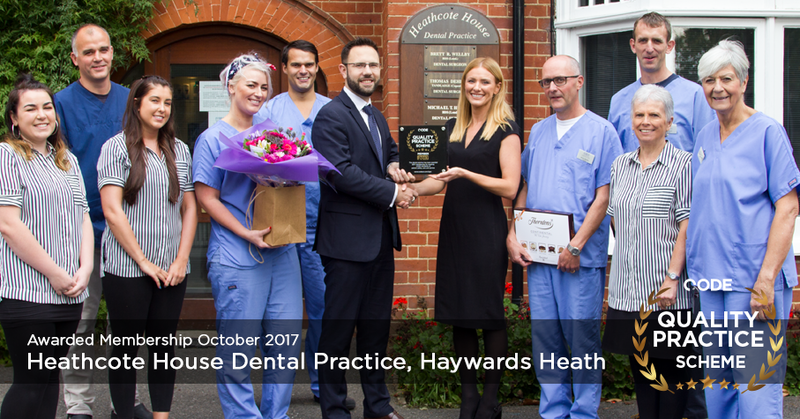 In October 2017, the team at Heathcote House Dental Practice were presented with the Quality Practice Scheme award by the dental compliance body, CODE. Alex O’Neill of CODE performed an in-depth inspection of our Practice & found we were meeting their Total Quality Management standards. Molly & the Dentist’s at Heathcote House would like to thank the Staff for always working so hard & to the Patients for making the experience so enjoyable!